From Blumhouse Productions, the horror thriller The Purge illustrates the government’s response to an America overrun by escalating crime and overcrowded prisons. For a 12-hour period, once a year, any and all criminal activity, including murder, becomes legal. And on this one particular night, James (Ethan Hawke) and Mary Sandin (Lena Headey), and their two children, will learn just how vicious the outside world can be. During a press conference at the film’s press day, producer Jason Blum talked about why putting families in danger makes for good suspense and horror films, what made Ethan Hawke the right guy for this project, how different audience interpretation of the film will be, his reaction when he first read the script, deciding on the look of the masks, and the benefits of working on a limited budget. He also talked about why he wanted to get involved with the remake of The Town That Dreaded Sundown, and how important it is to him to find a real reason why someone is actually shooting the footage, in one of his found footage films. Check out what he had to say after the jump. Question: You also have Insidious 2 and Paranormal Activity 5 coming up. Why do you think putting families in danger makes for good suspense and horror films? JASON BLUM: Well, I think good suspense and horror is really about creating situations that are relatable, and throwing a wrench in it and watching how people respond to it. And I think the most honest responses you get to watch are in houses and people’s most private spaces, like the bedroom or in your own intimate space. I think that’s where you feel safest, so when you’re threatened in the place you feel safest, it makes for the scariest situations. 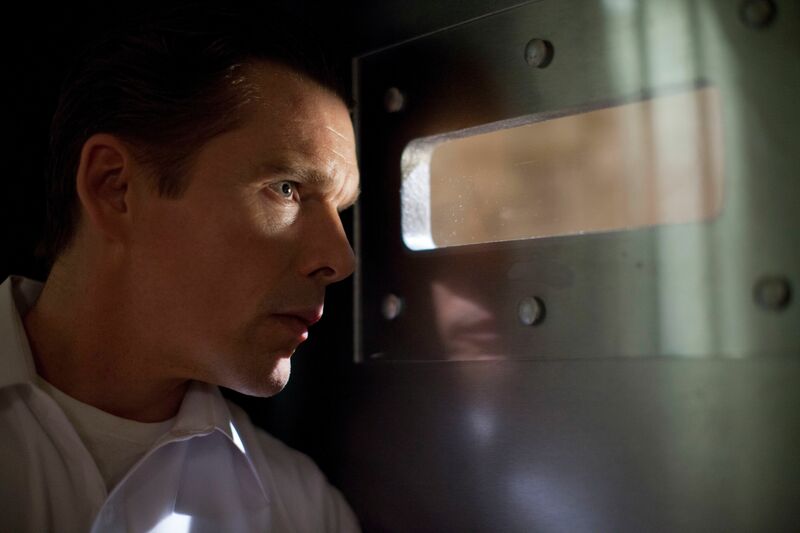 What made Ethan Hawke the right guy for this project? BLUM: He and I have been friends for 20 years. He was very resistant to doing a horror movie, and I spent a long time talking him in to Sinister, which he finally agreed to do. He liked it so much that, at the end of Sinister, he said, “Let’s do another one,” and that’s how we did The Purge. I like to work with actors who are not normally in these kinds of movies. I really like to work with theater actors. Theater actors tend to do lots of independent movies, and those are the actors that I like. I don’t always work with them on these movies, but I really tend to try, like with Patrick Wilson and Rose Byrne in the first Insidious. I try to work with people who you’re not used to seeing in scary movies. I think it makes for a more interesting mix, when you’re watching the movie. How much did you concern yourself with the interpretation audiences will have of this film? BLUM: Concern is the wrong word. I was into that. I loved that it was a great, high-concept scary movie. 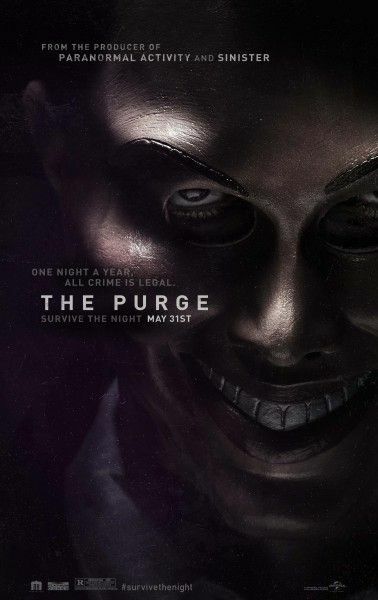 I love that (writer/director) James [DeMonaco] chose to set the movie after The Purge had taken place seven or eight times, so that there’s nothing unusual about it. The family you meet has been through this American tradition for many years. So, I loved how the movie worked on that level. And then, there are definitely social themes in the movie. I don’t think there’s a message, specifically. One interesting thing that happens is that, whatever political party you’re in, you come out of the film saying, “See, that affirms my beliefs,” which I think is cool. People on the Right are like, “The Purge is a terrible thing. This is an example of government getting into our private lives, when they should be smaller and get out of our private lives.” People on the Left say, “There are too many guns, and this is what happens when there are too many guns.” So, we made a really violent movie about violence in America. The fact that people will talk about that, after the movie, in addition to being scared, I wouldn’t say is a concern, but it’s on the plus side, in terms of deciding to go forward with the movie. I, personally, think The Purge is not a good thing. I’m not advocating for a Purge. I’m 99.9% sure that we’ll never wind up with a Purge ourselves, and I think that’s a good thing. We weren’t coming at it from a specific political point of view. It’s a really violent movie, and it’s supposed to get people scared and it’s supposed to get people to have a good time for an hour and a half, in a movie theater. If it also gets people talking about whether it’s a good or a bad idea, that’s a great thing, too. What was your reaction when you read this script, for the first time? BLUM: I didn’t read it, I heard it. James told me the idea. One of the most satisfying experiences in making the movie is that when you first hear the idea, you’re like, “That’s crazy! That could never happen!” When I’ve watched the movie with audiences, you see people into The Purge, by the middle of the movie. They’re applauding and are like, “Yeah!” And then, by the end of the movie, people catch themselves and are like, “Ew, I’m not so psyched about how I was feeling, at the middle of the movie.” So, what grabbed me about the idea was that, on one level, it’s a very abstract, crazy idea, and on another level, we’re having conversations, like the one we’re having now, that may it isn’t so crazy. That’s not to say it’s good to have a Purge, but maybe a Purge might happen. The fact that we could have those conversations is nuts, but it’s a tribute to James and his idea, which really works on both levels. They tried to make this movie as a more expensive movie, which I am very against. I don’t like making expensive movies. But, before I was involved, they tried to make it as a more expensive movie, and no one wanted to make it, for a lot of the reasons we’ve been talking about. So, the idea keys in to what we do, which is making movies for low budgets, that are strange and different and entertaining and fun, but make people think a little bit. Do you think that, if society was given permission to use violence for a day, we would all find the inner animal and survivor within ourselves? BLUM: God, I don’t know. I just hope it doesn’t happen. I hope it remains a movie. I think it would not be pretty, as a real idea. How did you decide on the design of the masks? Did you intentionally want them to look human? BLUM: We produced this movie with Platinum Dunes, Michael Bay’s company, and (producers) Andrew [Form] and Brad [Fuller], who work there, were very involved creatively, all through pre-production, production and post-production. We had a really great partnership, from working on other movies together. And one of the reasons I asked them to come along was ‘cause James had never done a horror movie before. Every other director that we’ve worked with has done more than one movie, and oftentimes have done a horror movie, but it was a newer thing for James. I really give James, and particularly Brad and Andrew, credit for focusing on what the masks looked like. I think they did a really cool job. I’m really pleased with what they chose. And there was a conscious decision to not make it like an animal, and to make it a face, but a face gone wrong. I think it’s effective, for that reason. How does it hurt and how does it help to have such a limited budget? BLUM: When you have a limited amount of money, you can’t spend a lot of time on special effects, on stunts, and on all the bells and whistles that directors like. If you have your choice, when you’re prepping a movie, and you have the choice to either go to ILM for two days and look at the test of a spaceship, or sit in a room with your actors and talk about story and their characters, it’s more fun to go to ILM, and I think that happens a lot. The effects and the explosions are more fun. If you take those things out of the occasion, it forces the director and producers to really focus on story and focus on character. I think there are a lot of benefits to doing movies low budget, and that’s one. Another one is that almost every single movie made is cast in reverse. The casting of movies is totally broken. When you’re a producer or director who’s going to get your movie made, you’re not asking, “What actors are good in these parts?” You’re asking, “Okay, what actors get my movie made, regardless of the parts?” Your chances of getting good actors in movies are so much better when you’re picking actors that fit the part. When I first start working with a director, I always say, “Take the list of actors you got from your foreign sales agent, rip it up, throw it out and don’t ever look at it again. Now, pretend your in college and you’re directing a play, and think about what actors would be great in this movie.” That’s another benefit of it. Those are two big things that I think are really tangential benefits to low budget filmmaking. BLUM: Ryan Murphy found the movie, brought it to me and said, “I wanna do it.” I didn’t find it. He brought it to me. I think he is an amazing, creative force, especially with horror. I think he thinks about horror in a really unique way. So, he pitched it to me and I really wanted to work with him. I didn’t know the [original] movie. That’s what got me interested in it. I have had a really good working relationship with him. And the whole point of why my business exists and why I’m such a fanatic about making movies inexpensively is that you get to do different stuff. We just wanted to try it. That’s the fun thing. When you don’t have a $20 million horror film, which is a typical horror movie studio budget, or a $180 million tentpole budget, looming down at you, you can try new stuff. It may work or it may not work, but the fun is that we can try. It’s a really weird movie to remake, and I really like doing weird things. How important is it for you to find a real reason why someone is actually shooting the footage, in one of your found footage films, versus just getting the best scares? BLUM: Paranormal Activity is found footage. The key to every found footage movie is, “Why are they filming?,” and it’s a nightmare question to answer. Although the found footage movies are much more production friendly, storytelling wise, they’re way harder. Scary movies are all about building up to situations that are life or death, and when it’s life or death, no one is holding a camera. So, that’s an incredible challenge. When we’re making Paranormal Activity, every year, we work on that question harder than any other question. A lot of the reasons why people are annoyed at found footage movies is because people look at it like it’s easy and that they could do it, too. And production wise, they are super easy. You don’t need lights. You just film. But, storytelling wise, they’re much harder than traditionally shot movies. The scares are the easier part of scary movies. The hard part of scary movies is what leads up to the scares. With The River, which is this TV show that I did, it didn’t really work because we ignored that question. The Purge opens in theaters on June 7th.